Recently, Lucas Reilly wrote an awesome article explaining what became of all of the wonderful mountains and rivers and pine trees Bob Ross painted over the years. Remember Balloon Boy? Now you can own a piece of the balloon he wasn’t in. 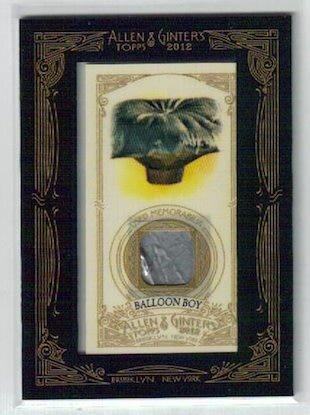 Topps has inexplicably decided to start producing trading cards with a small portion of the balloon attached to them. If you’ve ever wondered how Olympians from different eras would have fared against one another, you’ve got to check this article out. It allows you to simulate eight different Olympic events and see how the different generations stack up. It’s rather addictive, and clearly illustrates how superhuman our modern-day athletes really are. Congratulations to Paris, Madrid, NYC & Moscow. You Don’t Have to Host the Olympics. London won the 2012 Games, and they might regret it. That’s the estimated value of all of the movie props and memorabilia owned by Planet Hollywood and stored in their 50,000-square foot warehouse in Orlando. Eva Peron died exactly 60 years ago today, and then things got really weird.